It’s probably too late to be saying “Happy New Year” since it’s past the Australia Day long weekend but will say it anyway. Happy New Year! Hope you are all feeling refreshed and ready to give your best in 2019. As January seems to be a time when people decide to form a list of resolutions that they will keep for two weeks, I figured there was no better time than now to share a wonderful healthy recipe for you all. I am not a dietitian or a nutritionist but there is definitely a good balance of flavours and food groups here – protein, carbs and the good types of fat. The challenge I’ve had in the past with eating salad for lunch is the lack of feeling full afterwards. Turns out if you put enough grain and carby vegetables in, this issue is alleviated. Alright, enough blabbing. For those who are feeling the whole “new year, new you” mentality or even the “new year, same you” mentality, this salad is for you. For the quinoa, I cooked it in the microwave as per the packet instructions. Simply rinse the quinoa in a strainer, then place in a heatproof bowl that fits in the microwave with 1 cup of water (1:2 quinoa water ratio). Cover the bowl with a lid or a plate and cook for approximately 5 minutes. Stir and then pop it back in for 2 minutes. Leave to stand with the lid/plate still on until most of the water has absorbed. Strain remaining water and set aside. Once the quinoa had cooled down a bit and the sweet potato is ready, place these plus all the other ingredients into a bowl. Mix well until all flavours are combined. Add seasoning where appropriate. Note: if you’re storing this for work lunches, keep the beetroot separated so the colour doesn’t run through the whole salad. Serve immediately at a warm temperature or eat cold later on. Long time no see! I have been cheating on my kitchen with my credit card lately and it is now time to put a stop to that! I feel like my latest obsession is cheese (well it’s been a long running thing but it’s definitely concentrated at the moment). Last week, a couple of friends and i ventured out to Carriageworks for Bon Fromage a cheese festival which were giving out free samples of a diverse spread of European cheeses! It was actually heaven and unlike most places that offer freebies, this was a table absolutely filled with all you can eat cheese. It was the place of dreams. Alas, stemming from that, i have eating a lot of haloumi lately because a) it’s delicious b) it serves as a filling sub in for meat c) it cooks in less than 2 minutes! The only downside to haloumi is that it doesn’t travel well. It is best eaten straight off the pan. So for my Sunday lunch where I am at home, it works a treat. Grocery day today means I had minimal supplies in the fridge which is perfect for me since I find I am the most creative when I have a limited number of ingredients. (very Masterchef mystery box type of thing). If haloumi and sweet potato are sounding good to you so far, keep on reading and you can whip this salad up for yourself! Once the haloumi is cooked, plate up everything and finish off with a drizzle of extra virgin olive oil. Serve immediately. For the most part, I am trying to eat healthy. I am quite a bit fussy about salads though. They can just be so ordinary and unfulfilling. I always need something to give them a bit more substance. For example, quinoa, pearl couscous or a starchy vegetable like in this case, sweet potato. I cook with sweet potato quite a lot because it’s flavoursome, healthy and most importantly filling. I was out shopping earlier for groceries and noticed that my local store had pomegranates! I’ve eaten them numerous times but have never actually bought one. Decided to take the plunge and buy one. With a bit of manual labour, I managed to get out all the seeds ready for use. I normally don’t like fruit in my savoury salads but pomegranates are the exception. So in went a handful of fresh pomegranate seeds. Now for a dressing. I wanted something tangy but not with too much vinegar so went with a honey mustard style dressing. Easy to make with ingredients that most people will have in their pantries staples. Whilst the potato is baking, place all salad ingredients on your serving plate. Once potatoes are cooked, allow to cool for 5 minutes before serving with the rest of the salad and dressing. It’s my first week in Sydney for work in what seems like ages! This means meal prep is back on to start saving my coin for my holiday to New York City early next year. I do like salads for lunch, but only if they’re filled with lots of good carbs! A bowl of lettuce and raw vegetables can fill me up for a total of about 45 minutes. My favourite salad bulky items I love to use are quinoa and sweet potato. It’s amazing how much you can stretch one medium sized sweet potato. This batch of salad I’ve made is enough food for three days worth of lunches! Perfect. To compliment the sweet potato and quinoa, I have paired it up with a balsamic mustard dressing. Homemade dressings are the way to go to avoid all the preservatives and other assorted ingredients that end up in off the shelf dressings. On a lined baking tray, add the chopped sweet potato, olive oil, rosemary and thyme. Season with cracked salt then place tray on a high shelf in the oven. In a large bowl place the sweet potato, quinoa, pistachios and feta. Add dressing to taste. Serve immediately or store in the fridge for up to 3 days. So it’s the day that you’re due to do the weekly grocery shop, you open the fridge to what looks like a measly bunch of ingredients which will not pair up together. Wrong. Well let’s just say 85% of the time, I reckon you can still whip up something delicious even if it seems like all you have is the stuff that gets forgotten about in the fridge until the end of the week. Of course, the dream would be plan meals so efficiently for the week that you end up with nothing left on grocery day. However, as most people work and have other activities planned for their days, there often isn’t much planning around this. So instead of forcing yourself into planning your meals a week in advance which may not stick, try introducing yourself to the creative opportunity of leftover ingredients. (In saying that, if you are finding every week that you are throwing out the same unused ingredient, then cross that item right off your shopping list please). Today, I was going in blind. I really hadn’t looked in the fridge properly for a few days and so it was very much a mystery as to what to create for lunch today. I had just arrived home from martial arts training so was craving something fresh and filling. I didn’t want to wait around all day for my food so I saw the cauliflower and used that as a base for the dish. The rest was just odd bits and pieces. Slowly, a dish was coming together. Cauliflower. Check. Fundamental salad ingredients. Check. Dressing? It is always a satisfying feeling to make your own dressings from scratch. You know everything that goes into it, it will be fresh and most importantly, it will taste fabulous. With dressings I find measurements a little bit redundant at times, it’s a bit of a taste as you go experiment until the flavours match your palette. Okay so let’s have a look at what I created today from a bits and pieces collection of ingredients. Place the cauliflower on a lined baking tray with a small drizzle of olive oil and salt to season. Place in the oven and bake until golden. While the cauliflower is baking, prepare all the other ingredients and make the dressing. I decided to season my tomatoes with cracked pepper just for an added level of flavour. In a bowl, throw in the mixed leaves, tomatoes and cucumber. Place the baked cauliflower on top with the pine nuts and then drizzle the dressing over the top. You know when you just have a vision of something in your head and then when you go to make it, it 100% meets your expectations? 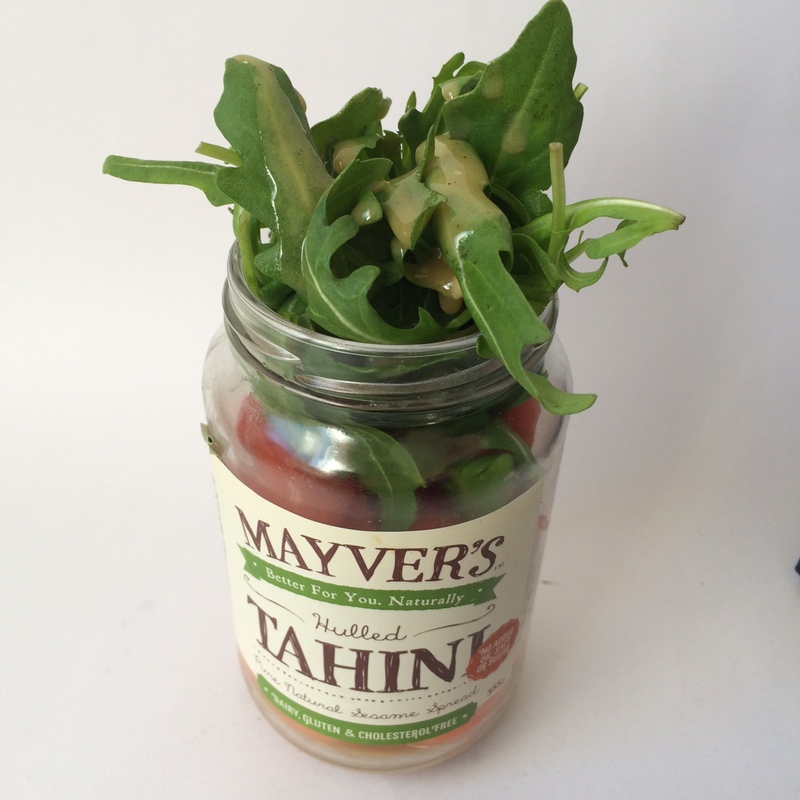 Well that happened today with this ahhhhmazing tahini salad dressing I made using one of my favourite brands Mayver’s Foods! My tahini stash is mostly reserved for the hummus production in my household, but I thought i’d try whip up something with it just because there was just enough in the jar to create something new! This dressing is gluten free and dairy free! I’ve used it in a quick salad I whipped up for lunch today featuring quinoa, carrot, tomato and rocket! Combine all ingredients in a bowl until desired consistency is achieved.